Abstract: The Southern Taunus is an area that experienced Carboniferous low grade metamorphism under elevated pressures. A sample of greywacke composition, described in detail, consists of feldspar phenocrysts, pseudomorphs after an unknown phase and epidote clasts. The matrix comprises quartz, albite, ferriphengite of variable composition, blue Na-amphibole, stilpnomelane, titanite, chlorite, hematite, magnetite, calcite and apatite. Microprobe analyses of the various minerals are given. The Southern Taunus Mountains are one of the few places of the Variscan orogen where blue amphibole-bearing schists occur. Blue amphibole in the Taunus was discovered by MILCH (1889), whereas stilpnomelane, another low grade index mineral, was recognized even earlier (KOCH 1880), but the first to use these parageneses to bracket the p-T conditions of metamorphism was MEISL (1970). Later MEISL et al. (1982) analyzed the amphibole and found it to be magnesio-riebeckite. Recently ANDERLE et al. (1990) used this sodic amphibole and thermodynamic modeling with an internally consistent dataset to model a p-T path. The result was peak conditions of 6 kbar and 300°C, followed by isothermal uplift accompanied by increasingly reduced water activity. However, up to now, no description of a single sample complete with microprobe analyses has been presented: a situation rectified by the present work. The Southern Taunus Mountains are situated at the transition from the Saxothuringian Zone in the SE to the Rhenohercynian Zone in the NW and are taken to represent the site of a former suture between the two Variscan zones (Fig. 1, WEBER & BEHR 1983, FRANKE 1989, ANDERLE et al. 1990). The low grade metamorphic rocks of the Southern Taunus belong to the Northern Phyllite Zone that spans the transition from the Hunsrück in the SW to the Wippra Metamorphic Zone (Harz mountains, SIEDEL & THEYE 1993) in the NE of the Taunus. Fig. 1: Outcrops of the Variscan belt in Germany and position of the site investigated. 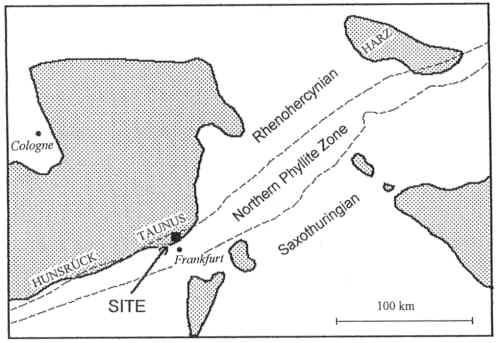 The transition from Rhenohercynian to Saxothuringian is indicated by the Northern Phyllite Zone (after FRANKE 1989). (1) Metavolcanics of rhyolitic, rhyodacitic, dacitic, trachytic, andesitic and rarely of basaltic composition usually regarded as representing a destructive plate boundary (comprehensive geochemical study by MEISL 1990). U/Pb-studies of zircons from these rocks revealed Ordovician to Silurian ages (445-425 Ma, SOMMERMANN et al. 1992, 1994) interpreted as the time of volcanic activity. (2) The Eppstein Schist Group comprising homogeneous phyllites and varve-like layered phyllites, composed of mm-thick light layers rich in quartz and dark layers rich in phyllosilicates. These varve-like layered phyllites are characterized by clasts of quartz, albite and muscovite (STENGER 1961). The age of sedimentation is still unknown, but it is noteworthy that the nearby sediments of the 'Bunte Schiefer' (Gedinnian, Lower Devonian) bear the same clasts. (3) The Lorsbach Schist Group enclosing a more variegated sequence of partly graphitic homogeneous phyllites, quartzites and varve-like layered phyllites (but without clasts, STENGER 1961). REITZ (1989) found spores of Lower Devonian (Emsian) age in this unit. For a review of the stratigraphy and a map of the area refer to ANDERLE (1987). MEISL et al. (1982) regard the Eppstein and Lorsbach Schist Group to be dominantly mudstones and siltstones and to a lesser extent sandstones and arkoses. The schists with clasts were regarded as badly sorted greywackes. KLÜGEL et al. (1994) analyzed the detrital components and obtained an age of 580 Ma (Cambrian) for the detrital white micas of an Eppstein schist whereas the Lorsbach schists yielded 415 and 440 Ma (Ordovician/Silurian, K/Ar). The metamorphic minerals derived from the fine-grained matrix for the various protoliths (Table 1) were given by MEISL et al. (1982). Table 1: Metamorphic parageneses (fine grained matrix) for the various protoliths of the Southern Taunus, after MEISL et al. (1982).